Embrace the magnificence of Kata Tjuta and capture Uluru at sunset while sipping sparkling wine and enjoying an Aussie BBQ. The best bits include: Uluru Sunset with glass of bubbly, Uluru guided Mala Walk, Uluru guided Mutitjulu Waterhole walk, Kate Tjuta Walpa Gorge and the Aboriginal Cultural Centre. Your professional tour guide will show you the real outback they love and enjoy so much. You will be collected from outside the Outback Pioneer Hotel, Desert Gardens or Sails in the Desert in Yulara (Ayers Rock Resort) between 11:40am-12pm and provided with a freshly made packed lunch to eat on the drive to the World Heritage listed Uluru and Kata Tjuta National Park. Travel to Kata-Tjuta (Olgas) for the first walk of the day into Walpa Gorge. Embrace the domes of Kata-Tjuta while taking in the views of the open plains on the return walk. Visit the Aboriginal Cultural Centre where you will have time to learn about the local Pitjantjatjara people and buy some souvenirs. The Cultural Centre was built with 90,000 mud bricks with the help of the local Anangu people. It is built on a sacred site and has very special meaning to the local Anangu people. Head to the base of Uluru (Ayers Rock), which is next to the entrance to the Uluru climb. From here one of your two guides will take you on a guided Mala Walk. The Mala Walk follows the north-west side of Uluru, where there are many fine examples of Anangu rock art, and you can experience the wonder of the sheer vertical walls. The guide will tell dreamtime stories of the Anangu People. Drive from the front of Uluru around to the Kuniya car park, which is at the back of Uluru. From here start your second Uluru guided walk to the Mutitjulu Waterhole. The guide will take you along a short track to the Mutitjulu Waterhole – home of an ancestral water snake called Wanampi. The guide will share stories of local traditions and explain how the Anangu people traditionally used the waterhole for hunting. The caves containing rock art were used in the past by Anangu still alive today. 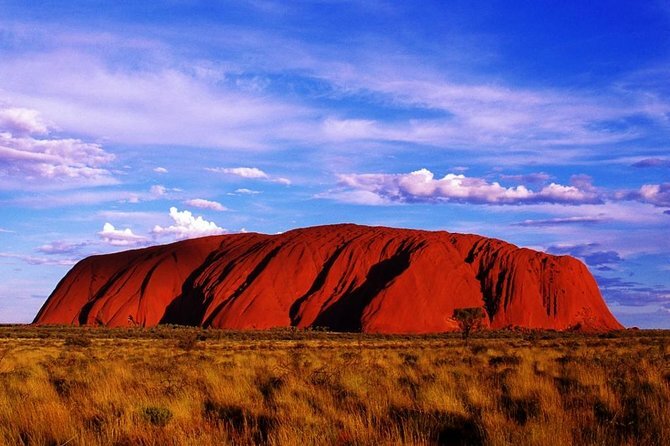 Finish your day with the breathtaking Uluru sunset and a glass of bubbly at a delicious Aussie BBQ. A spectacular day never to be forgotten. Where do I begin. This tour was worth every cent. It was a long day and we were there in January so it was hot to say the least. Our driver Trevor was very kind and very informative and did an excellent job. We were constantly supplied with food from chicken wraps to lollies, muesli bars, fruit cake and fruit.... and of course our bbq dinner at the end of this tour as we sat watching the sun set and the changing colours of Uluru. this is a must tour, but be aware its a very long day and some element of fitness would help to get the most out of this. We travelled here in January which is summer and it reached 47o so it was a challenge to say the least, water, water, water.... Everyone did things at their own pace to their ability. Great tour!! This was an excellant tour, the commentary was very informative. There was some walking and you need to take water with you on this trip. The BBQ dinner was very good and the sites were fabulous. The hosts took very good care of us during the tour with snacks and treats. They were very efficient, highly recommend this tour. Received notification that we would not be picked up or dropped off at Desert Garden Hotel as previously advertised, but since the coach came all the way from Alice Springs to pick up people in Uluru we could understand their picking up at only one place. Absolutely brilliant tour!!! So impressive!!! Highly recommend! Guides were very knowledgeable and fun. Day was well planed. Lunch and dinner great! Snacks and drinks all the time. Most important you will have great way to explore Uluru. We did almost full circle around the rock with two stops and guided walks. Tour ended with magnificent sunset over Uluru. Perfect perfect! Only thing i wish would be better is to have some free time for take pictures, have a small walk alone. Time at Kata Tjuta was just 40 mins which is literally hardly enought going till the gorge and coming back to bus. Uluru tour was much longer but we didn't have a minute to stay alone to enjoy the rock , just have a minute for photos, we were rushing to take photos. The rest and overall, the tour os great! Highly recommend. You will be very impressed! Our tour guides were funny and helpful. They told us many information about Uluru and Kata Tjuta, which was very interesting. Was a great tour, was able to see both attractions in the one day, very friendly and informed tour guides and was catered for all ages. I saw many interesting places. Our guide was fantastic. We had bad weather, there was no sunset, but I have photos with lightning over Uluru. I recommend this trip. This trip was exactly what I was looking for! I had limited time and really wanted to see both rock formations. Tour guide was friendly and informative. Weather was rainy, so at first I was a little disappointed, but I enjoyed seeing waterfalls at Uluru. Made my day. Tour was great value ! It was a nice trip but a long day. I wish I had booked a shorter tour just to see the sun set because the scenery is repetitive. The guides told long long stories while we are under the sun and it was quite diffucult to understand the aussie english accent. The good: The information provided was good, as was the sites visited. The not so good: TONS of flies - everywhere, including on the food, preparation area, etc. Also - often hard to understand the speaker - and not sure why there were three guides present...all hard to understand over the sound of the bus, etc. If you cancel at least 31 day(s) in advance of the scheduled departure, there is no cancellation fee. If you cancel between 4 and 30 day(s) in advance of the scheduled departure, there is a 50 percent cancellation fee.